Our Gitlab platform provides you with an easy way to manage your test scripts and execution. 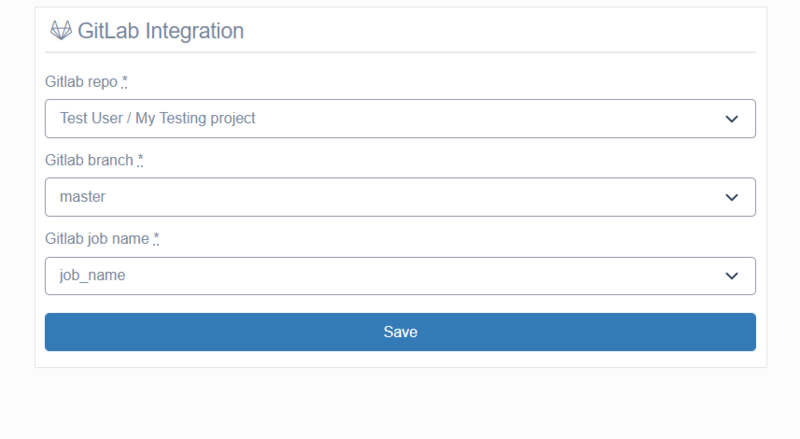 To make use of this feature, you first have to register on our gitlab.spritecloud.com environment. After registration, you have to setup your testsuite as a Gitlab project. We suggest starting out with forking our Cucumber boilerplate by pressing the fork button right under the repository name. Once you've done that you can then download the repository using the git clone command in combination with the URL that you can find on your newly forked repository page. The resulting command should look similar to this, but using your gitlab account name instead of. If you do not have Git installed you can read how to install Git for your respective operating system over here. We also recommend taking a look at this Git tutorial if you are unfamiliar with Git and wish to learn more about it before using it. When we open the project that we just cloned there are two files that we're interested in for setting up our testsuite so it can export the results to Calliope. PROFILE_ID: Tests will be imported in one of your profiles on Calliope.pro. you can find the ID in the curl command (see below). The 'script:' part is the command that is going to run when the job gets triggered. bundle exec cucumber -f json -o ./results/latest_results.json && true runs all the cucumber tests and stores the results in './results/latest_results.json'. && true makes sure the next commands are also executed. curl -X POST ... will import the tests into the Calliope.pro platform. Make sure the file @results/latest_results.json points to the results file you generated. After you've updated the .gitlab-ci.yml file and committed the changes to your repository, your test suite is ready to import results to Calliope, and you can configure calliope to use the gitlab jobs you've created. We're ready to configure the Calliope.pro profile to use gitlab! Make sure you have set your account gitlab settings on your account page. Now you can select your gitlab test suite, when we go to our profile that we set our test suite to export to and click 'edit profile' we can select a 'repository' and a 'job' from a list. Select the repository you created on our Gitlab environment and select the job you created in the '.gitlab.ci.yml' file ('curl-upload-example' if you used our boilerplate). Finally we can save the profile by clicking 'save'. When we return to our dashboard we can see that something has changed, the disabled play button is now active and we can click it to start a testrun. Also our profile's page has a two new tabs, 'log' and 'schedules'. In log we can see the logs of our current or latest test run and in 'schedules' we can let our test suite run according to a schedule that we set.